It’s fast and it’s fresh and on Wednesdays Whole Foods gives us a break- the salad and hot food bars are reduced from $7.99 down to $5.99. This is wonderful if you want to make up your own combination. 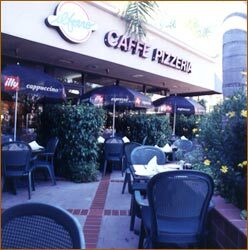 If you are anywhere near Ocean Park and 29th pop into IlForno Caffe and get dinner to go for $6. And I’m talking a entree size order of pasta, an entree size salad, or a pizza. Plus they all come with bread. Now this is take out only, cash only and available from 5:30 to 6:30. Dinner for two for $12 and you didn’t have to turn on the stove. Did I mention parking is free in the lot. And did I add that the food is fresh and fabulous. Take a night off, dial 310.450.1241, and they will have your order waiting when you cruise by. With multiple locations Zankou Chicken is a life saver. Whose at home? One meat eater, one dieter, one vegan? Order a steak kebob, roasted chicken wrap, falafel, and tabbouleh and everyone is covered. In the mood for noodle soup, sushi, or dumplings. Try the Japanese Mitsuwa Marketplace, 3760 Centinela Ave., Los Angeles, CA 90066 , where they have a food court with all kinds of prepared meals. Your kids are home from school and are now vegetarians – go to Samosa House and Bharat Bazaar at 11510 W Washington Blvd, Los Angeles, CA 90066. They cook only veggie meals ($7.99) and side dishes. Portos Bakery in Burbank and Glendale has all kinds of Cuban sandwiches and appetizers for a light dinner. And as a bonus, you can pick up one of their yummy desserts. They are open till seven and only take cash (correction) take credit and debit cards. What if you need an entire meal for a big dinner? Markets now have everything to make you look like the best home cook ever. Gelsons has a meal for every occasion. How does 2 1/2 pounds Beef Brisket with Julienne Vegetables & Gravy, Chicken Broth & Matzo Balls, Chopped Beef Liver with Egg, Potato Kugel, Tzimmes, Gefilte Fish with straight Horseradish, Charoses, Macaroon Cookies sound for Passover? How about Corned Beef, Boiled Cabbage, Boiled Carrots, Boiled Potatoes, Salad with Cilantro Dressing, Dinner Roll, Butter & Chocolate Mint for St. Patrick’s Day? These average about $10 to $15 per person for a multi course meal including dessert. And you get to keep the leftovers. Let me know your favorites and I will add them to the list. Ordered Gelson’s brisket etc. for a holiday dinner….wow was it ever disgusting…non-edible. This was the one in Calabasas…maybe other locations are better???? or do they come from same central kitchen? Porto’s in Glendale definitely takes debit and credit cards as well.